A team of researchers and collaborators from NASA's Jet Propulsion Laboratory, Pasadena, Calif., and the University of Arizona's College of Optical Sciences in Tucson has successfully conducted the first test flight of a prototype science instrument for a next-generation satellite mission to survey the impacts of aerosols and clouds on global climate change. The Multiangle SpectroPolarimetric Imager, or MSPI, is a multi-directional multi-wavelength, high-accuracy polarization camera that is a follow-on instrument to the JPL-developed Multi-angle Imaging SpectroRadiometer (MISR) aboard NASA's Terra spacecraft. It is a candidate instrument for NASA's Aerosol-Cloud-Ecosystem (ACE) mission, an Earth satellite recommended by the National Research Council in its 2007 Earth Sciences Decadal Survey. ACE mission objectives include characterizing the role of aerosols in changing Earth's energy balance (the balance between incoming solar energy and outgoing heat from Earth), especially their impact on precipitation and cloud formation. 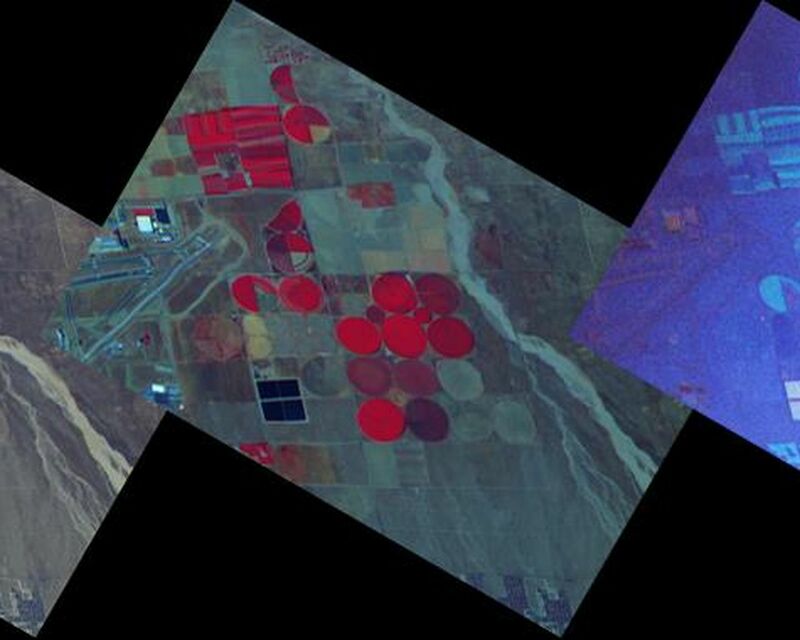 AirMSPI imaged the area around the Palmdale, Calif., airport during its first checkout flight on Oct. 7, 2010, as depicted in the three images shown here. These results are preliminary and have not yet been corrected for the effects of aircraft attitude fluctuations, which cause straight lines (like the airport runway) to appear slightly "wiggly." 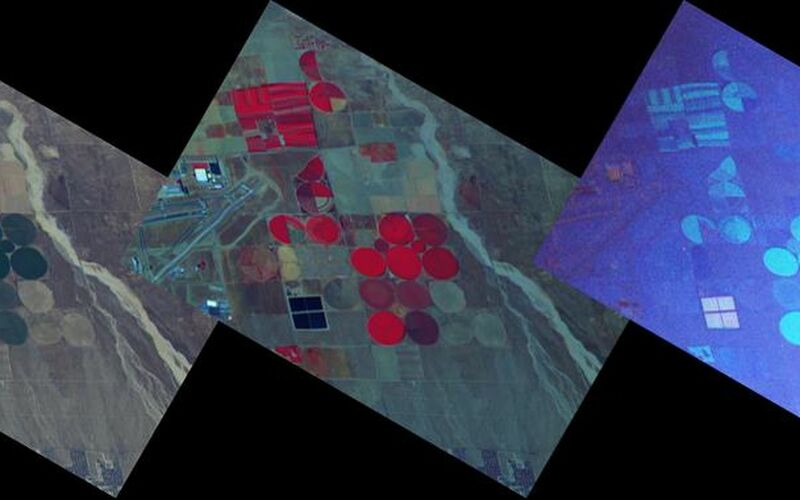 The left image (top in the annotated version) combines blue, green and red spectral bands to give an approximate natural color rendering of the reflected intensity. 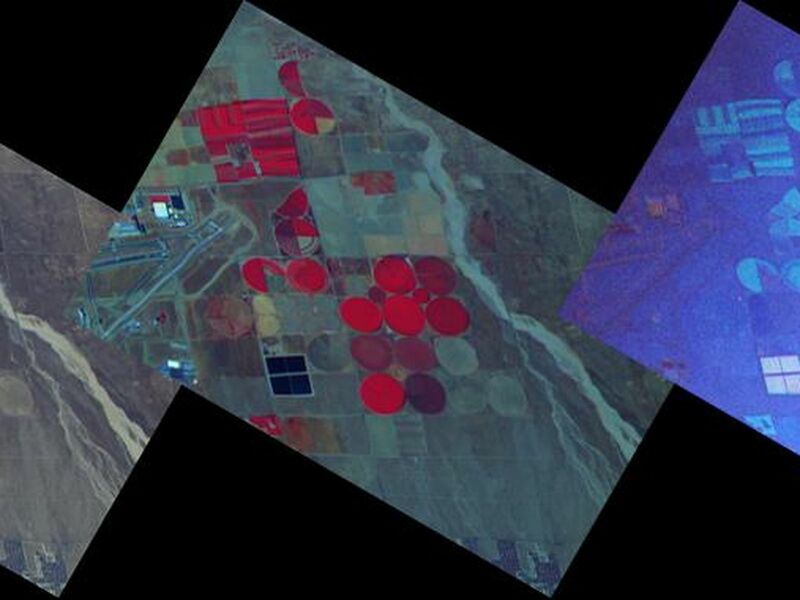 The middle image combines a different set of spectral bands, and highlights the presence of vegetation, which is highly reflective in the near-infrared. The right (bottom in the annotated version) color image, which combines the same set of spectral bands as in the middle image, shows the degree of linear polarization (DOLP) -- that is, the ratio between the portion of the light's intensity that is polarized (the light waves vibrate in a preferred plane) and the total intensity. Incoming sunlight is unpolarized (meaning that it is a mixture of all possible planes of vibration), but upon interaction with air molecules, aerosol and cloud particles, and surface materials, the light becomes partially polarized. The different appearance of this image illustrates how polarization provides additional information for distinguishing light scattered by the atmosphere from light reflected by the surface. Each image is 11 kilometers (6.8 miles) wide and has been rotated so that north is toward the top. An airborne prototype version of the instrument, the AirMSPI, was checked out Oct. 7 on one of NASA's high-altitude ER-2 Earth Resources aircraft during a two-hour flight from NASA's Dryden Aircraft Operations Facility in Palmdale, Calif.
For more information, visit http://www.nasa.gov/centers/dryden/Features/ER-2_Multiangle_Polarizing_Imager.html. For more on AirMSPI, see http://airbornescience.jpl.nasa.gov/airmspi/.